If you are removing damaged vinyl siding, the right tools include tin snips, utility knife, claw hammer, framing square, galvanized nails and a unique piece known as a zip tool. A zip tool has a thin, curved tip that you can slide in-between rows, catching the lip of the siding above. A downward pull will loosen, or disengage, a piece of siding from the courses above and below. 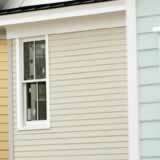 You will also need replacement siding that matches the color of the damaged piece. You could purchase some from the original manufacturer, or use scraps leftover from installation. However, keep in mind that surrounding panels may have faded slightly over time, so the best course of action might be to cut a piece of comparably faded siding from a low-visibility part of the exterior to use as a replacement panel. If you are in doubt when doing this project DIY, don't hesitate to call the manufacturer or a contractor. Ensuring that you are happy with the results is very important.